Two Ohio men have been charged with "criminal damaging" for wielding screwdrivers in a late-night attack that would have been savage and brutal, had the target not been a 12-foot inflatable snowman. Instead, it was savage and comical. 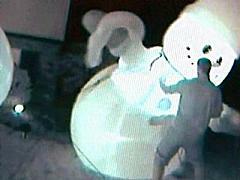 Homeowner and large-snowman-inflator Matt Williquette had gotten fed up with repeated night-time attacks on his Christmas yard decorations, so he finally set up a hidden motion-activated video camera to see if he could catch the perpetrator. A few nights ago, Williquette and his wife heard noises outside. "I thought I heard something but didn’t think much of it, but then my wife came running downstairs saying "Frosty [is] down." The attackers fled, but the camera had done its job, capturing two young men furiously assaulting the helpless, air-filled victim with screwdrivers. Frosty was critically injured in the attack, but has since been reinflated and returned to service. "The question I have is, Why me?" lamented Williquette, much as Job cried out and cursed his day when similar plagues were visited upon him. And this guy will probably get the same answer, basically: don’t ask stupid questions, patch up your snowman and try to get on with your life.